During testing I discovered something. 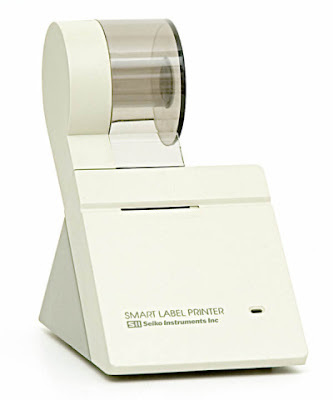 The SLP Plus can print to much wider paper than the SLP Labels. And after I realized that I can't buy SLP Labels locally, and that they would be too expensive anyway for printing shipping labels on, I decided to make use of that. 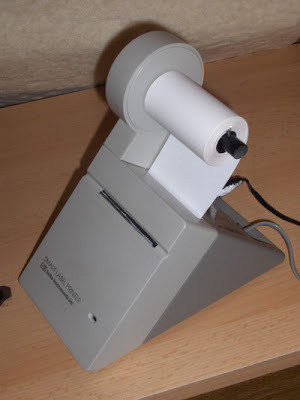 I got lucky because standard width thermal paper used in cash-registers fits perfectly into the SLP :) and they cost $0.50 a roll! as opposed to $7+s/h for two rolls of SLP labels, plus I also get to print more labels this way as I don't always need the full length of an SLP label, and with the paper I can just cut it at any length. karosium logo in glorious 1 bit per pixel. I also made a simple support for the new roll of paper that goes in the place of the original label holder from a medicine bottle cap and a plastic rod. Only disadvantages being that I have to use a glue stick as the paper isn't self adhesive, but I don't really mind that, and that I had to cut the front panel as the opening was only long enough for SLP labels to go through(and the cut didn't really turn out so well), as you see in the picture the serrated plastic bit used to cut the paper doesn't go all the way, only to the width of the SLP Label (that's one on top of the paper) I will have to replace it sometime, with one from a broken printer-calculator or something, but for now I just use an xacto knife to cut the paper. Now, the newer SLPs of course have a higher dot density (almost twice of the slp plus), so printing from the new software will be oversized, as it can't print dots as close together and as small as the newer ones, but as luck would have it that mismatch is perfect when using the cash-register paper, as it gives about the right size for the print. 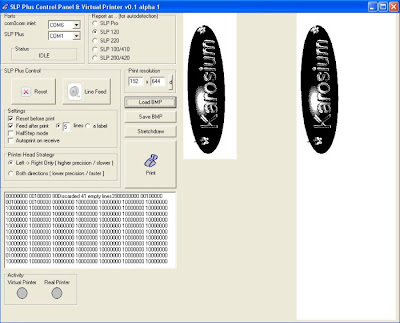 Also, by using another paper setting the correct size for the SLP labels can be achieved. I basically just have to use smaller label settings than what I actually want to use. While I don't know why Seiko dropped support for this thing, I think it's similar to the Creative driver shenanigans a couple of months or so back (to boost sales of newer models, and from what I've seen they kept on dropping support for older models in their software ever since the SLP Plus). This product would still be useful, despite being 10 years old, as it's only shortcoming is it's lower dot density when compared to newer models, and IMHO that isn't really a problem, as labels are still clearly readable, and any barcodes made are scannable... Does anything else really matter for a monochrome thermo-label? 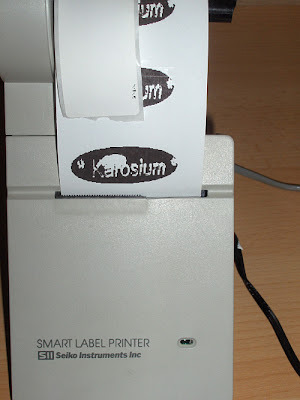 So basically, I got a hobby project to work on and a label printer for around $25 shipped, not bad especially considering the prices of the newer SLP printers, or label printers in general.